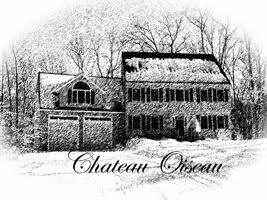 Chateau Oiseau: Farming is hard! I don't know exactly what I expected when I decided it was a good idea to plant a vineyard. 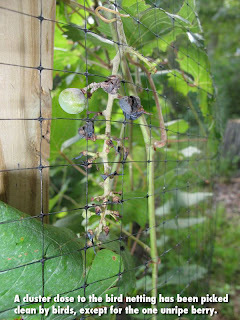 But one thing is for certain, I had no idea it would be so hard to get fruit all the way through the process to ripe. Yes, trellising, pruning, watering etc. were learning curves. Then I had to learn about spray fungicides because our humid New England summers are a black rot paradise. 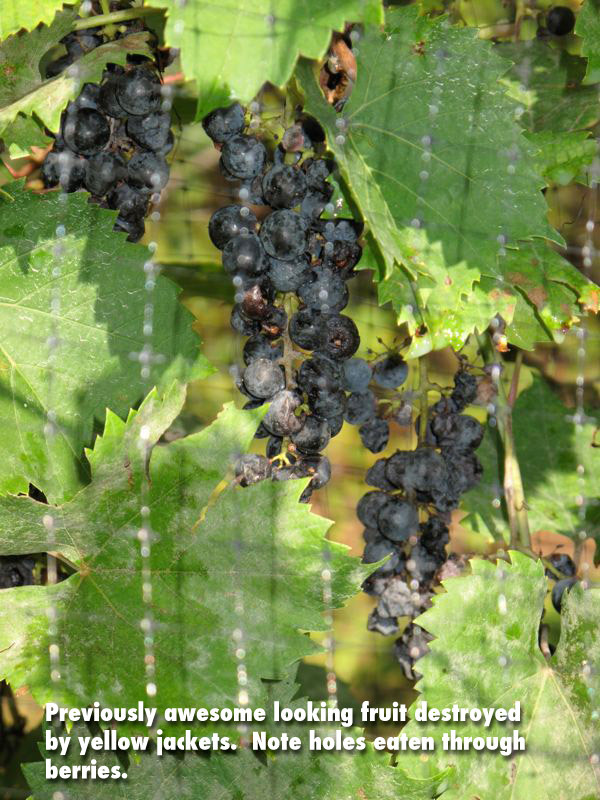 Then of course I had to learn about pesticides because every bug in the world loves grape leaves and grapes. Let's not forget the deer which have stripped all the leaves off many a shoot overnight. Last year I only managed to get literally a bowl-full of fruit to ripeness. I only had 3 vines mature enough to make grapes last summer. I assumed I had all my procedures down: fungicide schedule, insecticide schedule, and bird netting. This year, with 11 vines making grapes, even with that depressing loss of fruit to hail, I figured I would at least get 50 pounds of grapes so I could make a small batch of wine. Nope. I got absolutely zero fruit. Nada. Nothing. What was is this time? Yellow Jackets! They are of course those tremendously painful stinging bugs that many people think of as bees. Not bees. Bees are good. Bees pollinate. 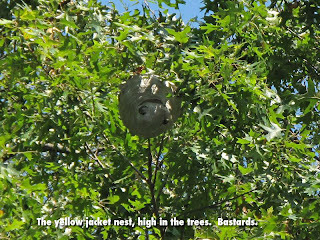 Yellow jackets are wasps that eat fruit--and as far as I can tell serve no useful purpose on planet Earth. Once once they found my grapevines, they built a nest high in a tree out of reach and destroyed my whole crop like a horde of locusts within only a day or so, before I even realized what was happening. Even though the fruit was sprayed with Sevin (a pesticide) the yellow jackets ignore that stuff. They are immune to most of the relatively benign pesticides that are not too toxic to people. So, the entire crop is gone...teaching me a valuable lesson in yet another critter I have to keep from attacking my grapes. Next year I need a two-pronged approach. The first is to kill the queens in the spring with Onslaught poison traps before they go and create a zillion workers to eat my grapes. 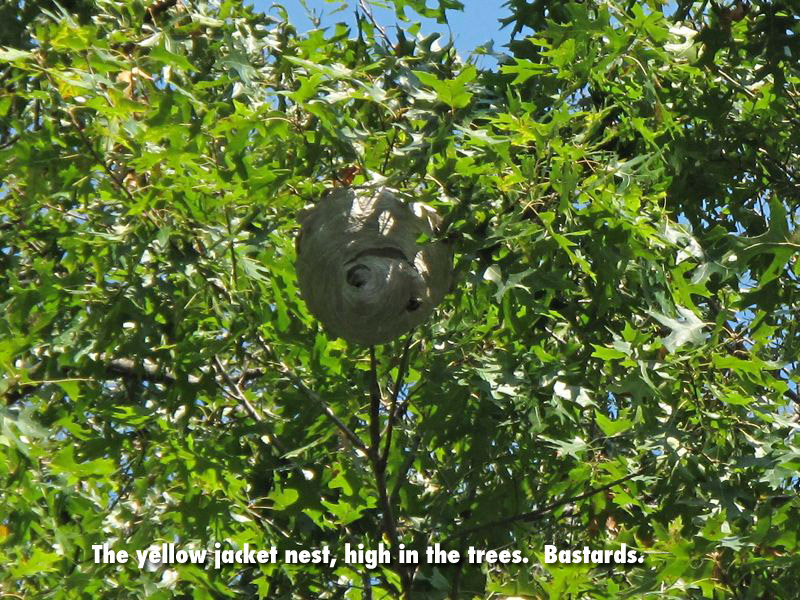 Next, I am going to experiment with insect netting instead of bird netting to physically exclude the yellow jackets from the fruit. 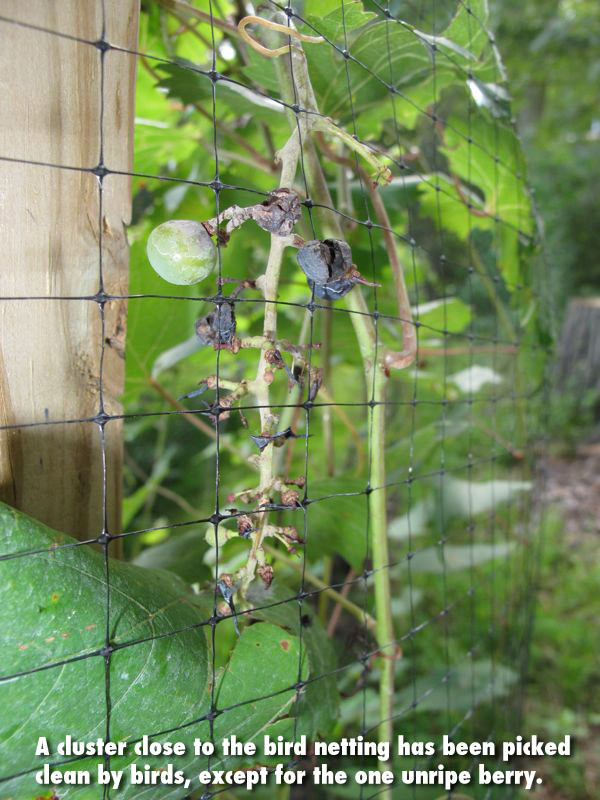 Also, I will build some T shaped brackets to hold the netting further from the vines as the birds still managed to stand on the netting this year and peck through to any fruit that was within a few inches of the net. One thing is for sure...grapes have a lot of sugar in them. (That's why they make good wine). Animals crave the carbs--it's like candy. Deer, rabbits, birds and yellow jackets, (God only knows what else) once they find your grapes, are voracious! It probably doesn't help that I live in the middle of the woods, surrounded by a zillion hungry animals. But one thing is for sure: farming is hard. There is some good news to report however. 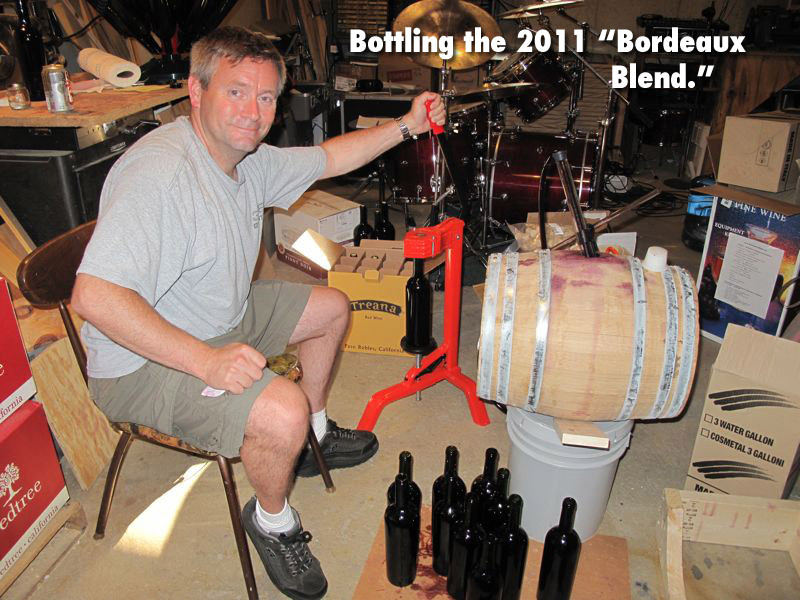 My 2011 "Bordeaux Blend" made with Merlot and Cab from Washington state (plus that bowl of estate-grown Marquette) was just bottled. As the second batch through my new 8 gallon Vadai Hungarian barrel, it has a fair amount of oak that is going to need some time to mellow. 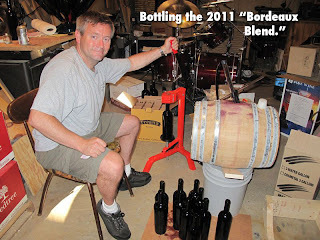 However, it's the first wine of mine that I really think is pretty darned good. It was awesome before going in the barrel. Now there is enough oak in there that I'm not sure it's as good, but hopefully the oak will integrate in a couple years and the micro-ox of the barrel treatment will shine through. We'll see.